V-level, Top Floor, End Unit, Center Or Top Row W Exceptional Views & Amenities! Aloha future guests! All properties in our ohana or family have Hawaiian names. We call this Kapalua Golf Villa, Hale O Alihilani', which means 'home where the ocean meets the sky'. TWO STAYS LEFT TO THE END OF THE YEAR! 11/4 TO 11/8, (4 NIGHTS) & 12/15 TO 12/22, (7 NIGHTS). JUST LIKE IN THE PICTURES, QUALITY RENOVATION, FABULOUS OCEAN VIEWS! Centrally located on the top row of the complex in building 24, this top floor corner "V" level villa has 1 bedroom, 1 1/2 baths and offers approximately 900 square feet of luxurious amenities with tropical accents and impressive panoramic ocean views. No disappointments here! Such a perfect setting for 2 adults to enjoy year round Hawaiian sunsets, warm ambiance and romantic moments just above the big blue ocean! ** Please note that a cleaning fee of $175 + tax will be charged for Hale O Alihilani'. ~ Resort Shuttle & no hidden fees! 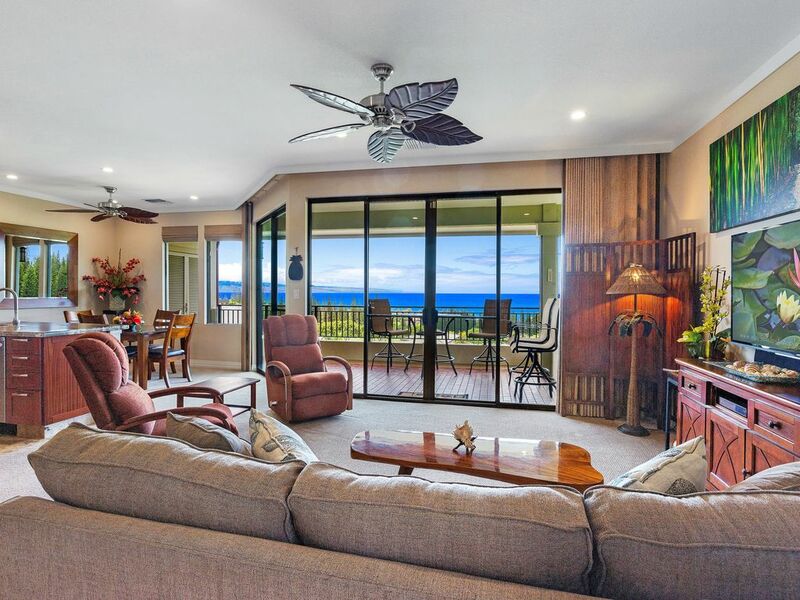 This 1 bedroom villa, approximate 900 sq ft interior not including lanai, resides in building 24 on the top floor with an expansive living space with windows and slider doors all facing west towards the magnificent Pacific ocean and incredible Hawaiian sunsets. This is an end unit so no one stays above or beside on one end providing a more expansive panoramic view. This villa has undergone an extensive renovation to both the exterior of the building and interior of this specific villa. Just completed in July 2014 and gladly accepted into our exclusive ohana of properties. All the properties we market have been updated to a standard beyond many claiming a 'gold' standard. That standard is fine for some but our owners decided they wanted something different with custom features more suiting to their own taste rather than the cookie cutter template models. ~ Meeting all our guests at the villas with "optional" Hawaiian lei greetings. ~ We can stock the groceries prior to arrival, with advance guest request. ~ A personal tour thru the villa highlighting all the amenities and how they work and all the while, answering any questions they may have from a locals perspective. We are on call for our guests 24/7 while they are on island. We want to be sure you are comfortable and confident in your home away from home. Dave Hailey, VP, Platinum Maui Vacations; dba of Vacation Marketing Inc.
About Dave Hailey, VP, Platinum Maui Vacations; dba of Vacation Marketing Inc.
View more about Dave Hailey, VP, Platinum Maui Vacations; dba of Vacation Marketing Inc.
My husband and I really enjoyed our stay in our Kapalua golf villa. The area was very quiet, the views of the Pacific, Molokai and Lanai superb. The pools were very clean, warm, and had Weber gas grills there for your use. The condo’s kitchen had everything you could possibly need with nice dishes and plenty of mugs and wine glasses. It even had a coffee grinder, so when you make your stop at Costco, pick up your coffee in bean form! The king bed was very comfortable and had very nice quality linens. The beautifully remodeled bathrooms were spotlessly clean. Loved the rainfall shower head. There was ample hot water. The only suggestion I would make is that it is approaching time to replace the recliner chairs in the LR, which are rather worn and balky. Nice new comfy sofa! Nice quality deck set for dinner and sunset viewing. Nice new full size stackable washer and drier in the half bath. This place is a gem! Excellent base to explore the island! Lovely villa, even better than described by Dave! Great location and lovely facilities and balcony to watch the sunset over the sea, pictures do not do the place justice, would certainly stay again if I am back in Hawaii!!! Just back home from a relaxing stay in a spacious, clean and convenient condo in the Golf Villas of Kapalua. In addition to the tasteful decor and magnificent ocean view, the well appointed kitchen made enjoying breakfasts and lunches and even a few dinners in our condo very possible. Although there is an “on call” shuttle that serves the Kapalua Resort we could easily walk to Kapalua Bay beach for excellent snorkeling and relaxing beach time. Dave, our attentive property manager was friendly and readily available though had no real issues with the condo that required his attention. Would definitely try to book this unit again. Very well-appointed condo with fantastic view! One of the best golf villas that we have stayed in! This property was beautiful, spacious & perfect for two whether enjoying a honeymoon or anniversary!! We really appreciated having the beach chairs & other necessities available for use! Thank you!! The property was exactly as billed and more. Incredible views plus lots of little extras, like beach and snorkel gear. We would recommend this for anyone. Kapalua is one of two of the nicest resort areas on the island. The difference is our beauty is more natural and not as much man made. We get a few more showers than some areas but this provides a slightly cooler and greener experience while still providing plenty of sunshine most of the year round. Our coastline is more a series of Bays rather than all rocky cliffs or all open water beaches. This environment offers superb snorkeling in safer waters with multiple reefs protecting swimmers from some less welcomed and larger marine life. Walking and hiking trails are plentiful and shopping and touristy areas are 10 to 15 minutes away.